1.Put the flour in a tray. Add in icy sugar, yeast, baking soda, almond chips and knead evenly. Add in corn oil and blend. 2.Divide the mixture into 50 portions. For every portion, use hand to knead into circular shapes and press. Then arrange and put on a baking tray. 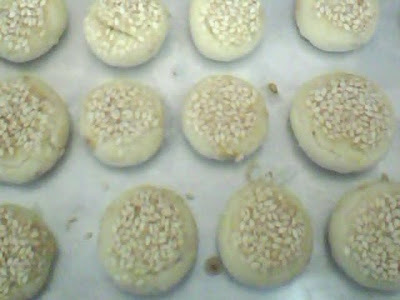 Rub every almond cookies with egg and sprinkle with white sesame. 3.Then out inside an oven and bake between 250 to degrees for 15 to 20 minutes. 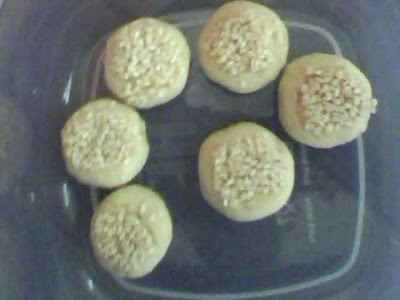 Bake till aromatic and golden in color.